We’d love your help. Let us know what’s wrong with this preview of The Lost Art of Disciple Making by LeRoy Eims. To ask other readers questions about The Lost Art of Disciple Making, please sign up. This is sort of a “classic” in the church ministry genre, but was a first-time read for me. There’s nothing earth-shattering now, but I imagine it was fairly revolutionary when it was published in 1978. It isn’t that today’s churches have mastered discipleship — we certainly haven’t — there are just a lot more materials available today. The Trellis and the Vine, for instance, covers many of the same topics, but is more practical and relevant to the 21st-century. Still, there is something encourag This is sort of a “classic” in the church ministry genre, but was a first-time read for me. There’s nothing earth-shattering now, but I imagine it was fairly revolutionary when it was published in 1978. It isn’t that today’s churches have mastered discipleship — we certainly haven’t — there are just a lot more materials available today. The Trellis and the Vine, for instance, covers many of the same topics, but is more practical and relevant to the 21st-century. Still, there is something encouraging to be reminded that there are no “new” ideas in church ministry (at least, none that are based on Scripture). In every generation, faithful scholars, preachers, and theologians remind us that God never changes, and His design and purpose for His Church remains the same. He desires that every Christian would be growing into spiritual maturity, while simultaneously making disciples of others. LeRoy does an incredible job of not just explaining the the different tools and stages of disciple making, but he uses God’s Word (primarily the ministries of Jesus and Paul) to confirm everything he is teaching in this book is biblical. This book was extremely helpful, would recommend to all followers of Christ. Discipleship is costly, but it is w LeRoy does an incredible job of not just explaining the the different tools and stages of disciple making, but he uses God’s Word (primarily the ministries of Jesus and Paul) to confirm everything he is teaching in this book is biblical. This book was extremely helpful, would recommend to all followers of Christ. Decent. Eims walks through the process of discipling others, but the book felt a little fluffy. If you want more on discipling others, multiplying disciples, etc. within church planting movements, look up T4T: A Church Planting Re-Revolution by Steve Smith and Ying Kai. This book is helpful with defining discipleship, giving practical tools, and creating vision for a life of multiplication. Quick and helpful read. From what I recall, I enjoyed the appendices more than the actual text. I highly influential book for my understanding of discipleship and its importance. Disciples are not made over night! Like raising a child it takes a lot of blood sweat and tears. This book lays out this reality clearly but also provides great encouragement that the job can and should be done! This is a Must read for all serious disciple makers!! One of the best books i've ever read. All believers should read this book! A very practical guide to discipleship ministry or "personal ministry" as practiced by the Navigators and Campus Outreach, among others. After reading it and having seen (but not participated in) such a ministry I the past, I feel like I have all the information I need to start in this philosophy of ministry myself. It's general enough that it's not specific to church or campus ministry, but can apply to laypeople like myself. A must read for any Christian desiring to understand the Biblical meaning of producing disciples. This book will open the heart and eyes to the need of making disciples, not just studying a "disciple course", but seeing Christians who can produce other disciples of Christ. The author definitely accomplishes his goal with writing this book...to teach on the importance of making disciples for Christ and how to go about fulfilling that! Having been first written in 1977, I believe, I wonder how many other books in that time were committed to discipleship? End times, sure. Evangelism, absolutely. But discipleship as an investment in others, I really wonder. But this got the ball rolling. Passing along much of what he acquired and practiced from the Navigators (Dawson Trotman is quoted extensively here), he compiles with tools and story after story of how important investing in others is. 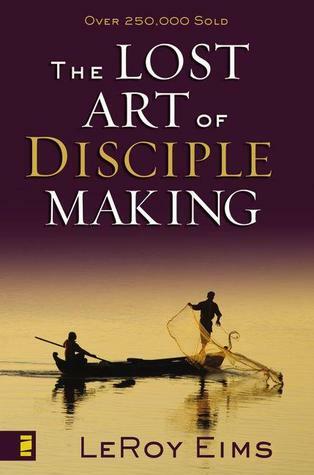 A good book on how to do discipleship. Most books on discipleship focus on what you need to teach the person you are discipling. This book does a little of that but focuses more on the how to go about finding a disciple, developing/training a disciple and preparing disciples for their own ministry. This book was a challenging read. This is something I aspire to and gave me a lot to think about. Learning how to apply these concepts I am guessing takes time. So with that I press on! The person I recommend this book to: Anyone looking to share their hope and seeing that grow. This book would not be for the weak or even lukewarm of heart. A phenomenal book on the importance of making disciples. The author really focuses on practical ways that we can teach people how to become disciples of Christ. I found that almost every page I highlighted something. I would recommend this book to any person who leads a team of people working on the mission of Christ. A challenging and though provoking book that made me think of how I am approaching the Art of Discipleship. I loved that God is always the centre of this process and it comes light powerfully in this book with the submitted heart and great relationship Leroy Eims brings across. I Highly recommend this book for a church group to study through. Its what I did and it was fantastic time of growth. Simple, straightforward, yet dry little book about discipleship but very detailed. Helpful for anyone in ministry or leading others or anyone who just wants to know more about the process of discipleship. My heart trembles every time I see this book. The passion, the sincerity, the love of God's work; all written passionately in every words of it. One of the fuel that keeps me burning for discipleship. A very practical book that is also an easy read. Very clear steps and ways to help the discipleship process. Probably the most practical book I've read on discipleship; I read it or parts of each year as a refresher for discipling students (and my children, too). Good principles, terrible to read.